Flatfoot is a biomechanical condition in which the medial longitudinal arch collapses, causing flattening of the foot towards the ground. In adult-acquired flatfoot, the subtalar joint has a greater range of motion than a normal foot, and multiple factors can cause the onset of this condition. 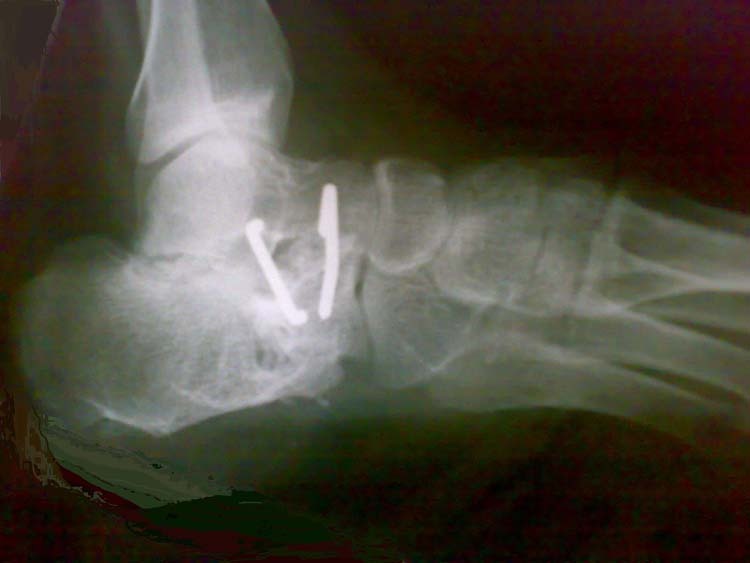 Subtalar arthroereisis with endorthesis is a surgical procedure by which an implant is positioned in the sinus tarsi depression in order to limit the excessive pronation of the subtalar joint. 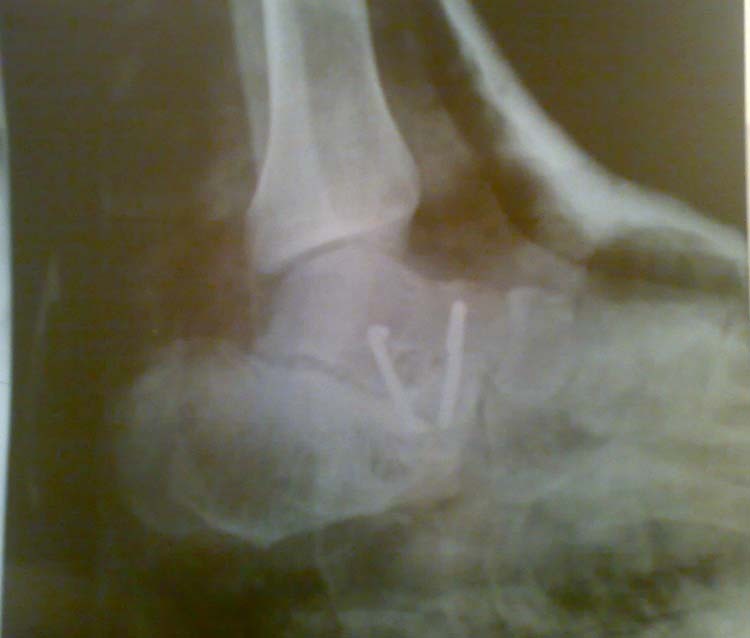 Subtalar arthroereisis is often associated with adjunctive procedures. A period of three weeks of non-weight bearing is recommended after surgery and additional protection is achieved as the load is increased. In order to be able to discuss the postoperative course, it is useful to be able to classify it. Basically, the classification proposed in this paper is a practical/theoretical instrument which seeks to contribute to a better understanding and achievement of the aims and outcome desired at each stage described. Postoperative rehabilitation must be oriented to both protect the surgical site and to enhance foot mobility. We have proposed a classification of the rehabilitative pathway after subtalar arthroereisis with endorthesis based on our experience, also considering the related literature. Furthermore, we provide a synthetic description of the surgery, and the rehabilitation techniques are discussed. The ultimate goal of the rehabilitation project is centered on obtaining the physical condition closest to that required for the daily activity of the healthy population with the aim of returning to full recovery after surgery. To this end, a certain degree of multiprofessional cooperation is always recommended in order to ensure patient safety and obtain the best results. Key words: Flatfoot, Gait, Prostheses and Implants, Rehabilitation, Subtalar Joint, Surgical Cast, Weight-Bearing. Flatfoot (FF) is a biomechanical condition in which the medial longitudinal arch collapses causing flattening of the foot towards the ground. The onset of this disorder may occur at different ages from the first years of life up to adulthood. In adult-acquired flatfoot (AAF), the subtalar joint (STJ) has a greater range of motion than a normal foot, and multiple factors can cause the onset of this condition. The STJ is a diarthrosis (trochoid) which connects, in two different locations (separated by the sinus tarsi depression), the posterior-inferior surface of the talus with the superior face of calcaneus and the anterior-inferior part of the talus with the anterior-superior surface of the calcaneus. The articular activities possible at this level are adduction and abduction of the rearfoot, associated with the supination and pronation of the foot, respectively. The realization of these complex movements is facilitated by Chopart’s joint (midtarsal). Arthroereisis is a surgical procedure which limits the amount of motion possible in a joint which has become excessively mobile. In subtalar arthroereisis (SA) with endorthesis, an implant is positioned in the sinus tarsi depression in order to limit the excessive pronation of the STJ, which is typically present in AAF. [4-6] Although it has proven to be an effective surgical technique, certain complications are described in the literature. [7-10] Essentially, in the past, major interest was focused on pediatric patients. [11,12] More recently, Evans (2008) has defined a therapeutic algorithm for rehabilitation treatment in children. Originally, the insert of an expandable orthosis was used for the treatment of pediatric flat foot. [14-16] Characteristics of the implants are discussed in the literature. Evans and Rome (2011), have found that there is limited evidence of the efficacy of non-surgical intervention in children with flexible flat feet. In their research, these authors have also provided a wide and complete overview of the surgical approaches available, including arthroereisis. As introduced above, pronation is one of the movements (together with supination) possible at the subtalar level; one must be aware of this because valgus of the rearfoot characterizes AAF. Postan et al. (2011) have discussed the association of the anatomical variations of the spring ligament and sustentaculum tali with the risk of developing AAF. Chang and Lee (2007) have provided a careful description of the kinematics, the surgical treatment, and the indications and contraindications as well as the postoperative management, and have described one condition which causes flexible AAF namely: the posterior tibial tendon dysfunction. For the correction of AAF, adjunctive procedures are often carried out using SA. A period of three to four weeks of non-weight bearing in a cast is recommended after surgery and additional protection is achieved with the use of a walker for more three weeks as the load is increased. The main purpose of this study was to classify the rehabilitation phases after surgical correction of AAF by means of SA with endorthesis. The literature was reviewed to identify studies which have investigated postoperative rehabilitation after SA. To our knowledge, no previous papers have been published on this matter. We herein describe the procedure of subtalar arthroereisis with endorthesis in association with additional procedures on soft tissues for the treatment of painful and flexible AAF. [5,20] Subtalar arthroereisis locks the sliding between the talus and the calcaneus, restoring their positions; an implant (ProStop®, Arthrex Inc., Naples, FL 34108, US) is inserted within the sinus tarsi determining the reduction of the pronation of the STJ acting as a self-locking wedge, according to Vogler’s classification. 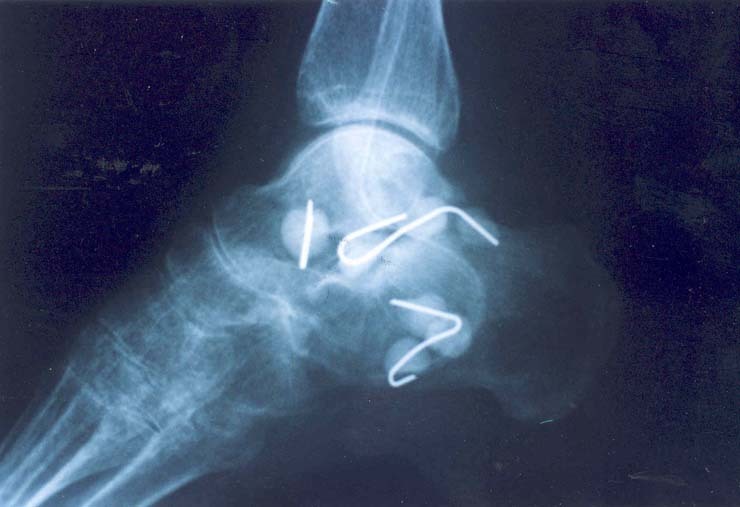 This system is composed of titanium cannulated screws, threaded and conical in shape, of different sizes (7 to 12 mm) and lengths (12 to 16 mm) so that they can be precisely adapted to the tarsal canal. The anesthesia is generally spinal and specific for the limb operated on. It is carried out by injecting anesthetic into the subarachnoid space with a 25 Gauge needle by means of a injection of the dura mater and of the arachnoid in the lumbar spaces below L2. To this end, the patient is positioned in a sitting position or in lateral decubitus, and the procedure is performed aseptically. Before placing the patient on the operating table, one must wait approximately 5-10 minutes to evaluate the level of the anesthesia. The surgical technique is performed with the patient in a supine position on the operating table with a tourniquet at the root of the thigh root after inserting the limb into an Esmarch bandage. The tourniquet is applied to induce lower limb ischemia so as to create a bloodless field in order to better identify the vascular structures, nerves and tendons. An incision of approximately two cm on the lateral portion of the sinus tarsi is made, allowing the insertion of a guide wire between the two beams of the talar-calcaneal ligament and the interosseus ligament; this facilitates the introduction of a size tester. Under fluoroscopy, the correct implant dimension is determined and the surgeon can proceed with the insertion of the screw using a screwdriver until, the screw itself, is level with the outer edge of side wall of the talus neck. The guide wire is removed and a stitch is applied. At this point, the tension of the triceps tendon is evaluated and, if necessary, a Hoke’s percutaneous tenotomy is performed to achieve the appropriate dorsal flexion of the ankle joint. 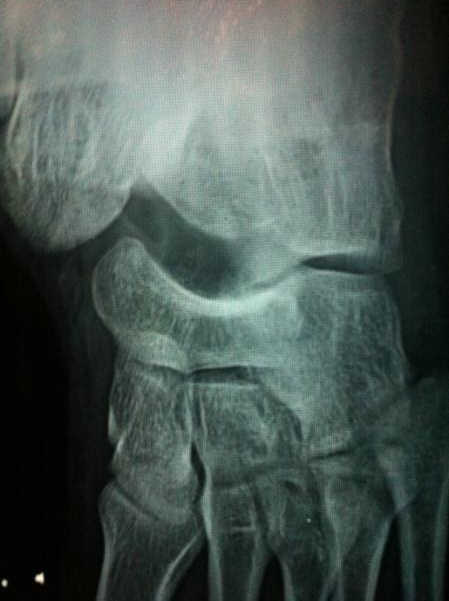 Subsequently, to correct the talus protrusion, an additional internal procedure of tensioning of the posterior tibial tendon is carried out:[23,24] an incision of approximately four cm is made on the navicular tuberosity, the tendon is detached from the navicular tubercle maintaining the plantar extension of the fibers, and the periosteum is dissected. The prominence of the navicular is then tangentially excised and, if present, accessory bone is removed; tenolysis, repair and tensioning of the posterior tibial tendon are performed at this point. The surgery, including the additional procedures as described above, requires approximately 60 minutes. Antithrombotic prophylaxis is managed at home with low molecular weight heparin for thirty days after surgery. During the postoperative course, the patient must use a walker for thirty-five days and walk without weight bearing for the first three weeks. Between days twenty-one and thirty-five, the load is progressively increased. In order to be able to discuss the postoperative course after SA with endorthesis, it is useful to be able to classify it. Basically, the classification proposed in this study is a practical/theoretical instrument which may help professionals to better understand and achieve the aims and outcome desired at each stage described. Each phase must be carefully evaluated both physically and clinically. If we think of the STJ as two overlapped cylinders, we immediately realize that, at this level, the maximum range of motion is possible in the transverse plane: the cylinders can thus produce movements of pronation and supination. Conversely, flexion and extension are limited due to the anatomical surfaces (Fig. 1). 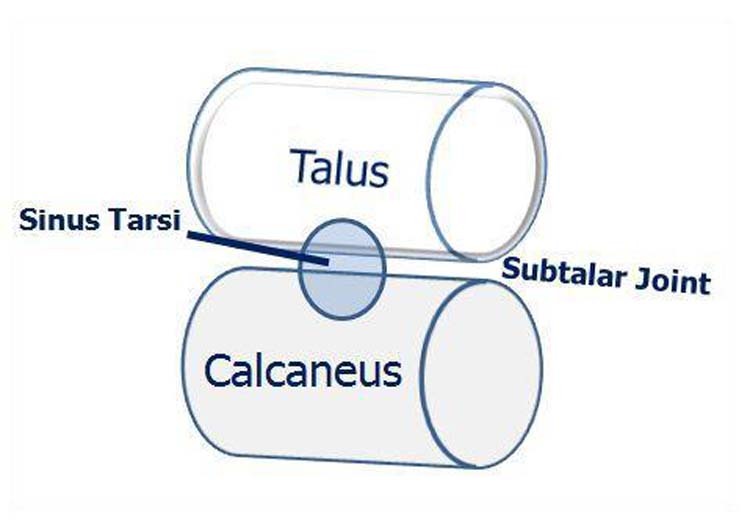 Figure 1 Schematic representation: sinus tarsi is an anatomical space present between the talus (top) and the calcaneus (bottom). Due to the anatomical surfaces, the two cylinders can roll one upon the other (pronation and supination). After surgery, patients are advised not to put weight on the foot and to use a walker in order to protect the surgical site for a period of three weeks. In this initial phase, the patient is likely to be overcautious and have some degree of fear, in carrying out the usual daily activities. Both, pain and infection prevention procedures are similar to those provided in arthroscopic surgery of the ankle. Conversely, patients undergoing ankle arthroscopic excision do not wear a cast after surgery and they are advised to limit the range of motion and to protected the load in the first twenty-four hours postoperatively. On the other hand, in surgical procedures of the ankle more invasive than SA, patients are encouraged to exert weight after surgery. In patients undergoing SA, if a physiotherapist is involved in stage 1, in order to prevent/manage any complications, he/she must be present as a counselor and must refer every unusual condition (after clinical evaluation) which may compromise the postoperative course. When no red flags (severe pain, heat, inability to walk even with the walker) are present, the rehabilitation activity is limited to observation and advice (sleeping with minimum elevation of the feet putting a pillow under the mattress, walking short differences but often, maintaining proper alignment of the pelvis through the correct use of crutches, noting if there is blood in the dressing, regularly using the walker). Orthopedic procedures are recognized as the most painful because of the need to walk. In stage 1, pain should be low to moderate and no additional treatment is usually required. Otherwise, the patient must be referred to a physician. When the dressing is removed after 35 days, the physiotherapist must check for the presence of edema. If, in the previous stage, pain control was obtained by means of anti-inflammatory drugs or painkillers, the residual -algic conditions must now be evaluated and eventually treated by referring the patient to a physician. Permanence of the -algic symptoms represents a complication assuming that, after one month, in almost all cases, pain should be at a minimum. Nevertheless, a certain degree of discomfort is present during or after walking/standing. Furthermore, in this period, which covers the first 35-50 days, the presence or absence of possible algodystrophy must be evaluated. Tenderness, vascular instability, stiffness and swelling, if present, are red flags for this issue. On the other hand, if the foot is not swollen, not hot and not painful, the edema (if present) can be treated through massage, and elevation at night. Thanks to the surgical technique, manual treatment of the sinus tarsi scar is not usually necessary (minimal access); conversely, manual massage is performed to facilitate the disappearance of the scar on soft tissue procedure sites using an elasticizing cream (Rilastil® Laboratori Milano, Istituto Ganassini S.p.A. di Ricerche Biochimiche, 20139 Milano, IT) (Fig. 2). Usually, at the end of stage 2, the patients no longer need a walker and/or crutches. Weight bearing is progressively allowed and the patient can wear sport shoes. Articular mobilization should be pursued at the following levels: talocrural joint and forefoot. Figure 2 Scar massage on the surgical access of the posterior tibial tendon. To protect the implanted endorthesis, pronation and supination of the STJ are not required or even encouraged. 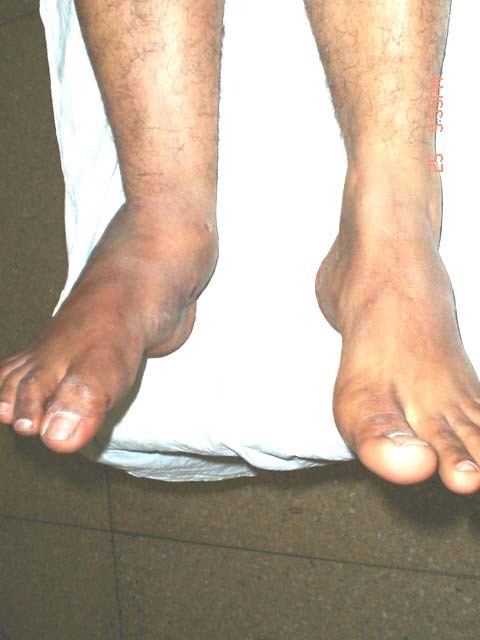 As described above, this diarthrosis would be comparable to a pair of overlapped cylinders which move around the longitudinal axis of the foot. Why force pronation or supination at this level when, after surgery, they are protected? Conversely, mobilization of the areas peripheral to the surgery are recommended in order to achieve the maximum interest on the part of the patient in recovery. Plantar and dorsal flexion of the ankle and mobilization of the forefoot are carried out with the patient in a supine position with the knee supported in flexion: block the STJ with the proximal hand to avoid pronation or supination at this level during articular recruitment (Figs. 3 and 4). The proprioceptive component is important at this stage and should be composed of several levels, compatible with weight bearing. The manual approach should start with closed kinetic chain exercises stimulating coordinated muscle contraction in the articular segments of the lower limb increasing the capsular-ligament stability of the ankle itself. 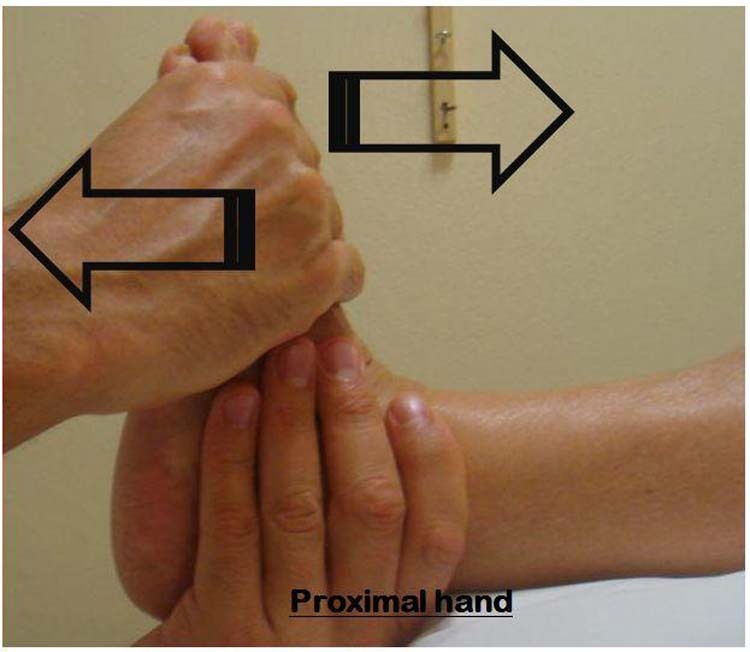 Figure 3 The physiotherapist’s proximal hand blocks the STJ to limit eversion and inversion of the foot whereas plantar and dorsal flexion are performed. Figure 4 Passive movement of the first ray with the STJ blocked by the proximal hand. In addition to developing muscle strength, these exercises optimize the functional capacity of the individual by encouraging recovery of the physiological activities of the joint operated on. Closed kinetic chain exercises take advantage of the normal joint structure, and the entire proprioceptive system is stimulated. To perform exercises with patient in a supine position, the ankle is placed in a side panel in front of the subject. Making the first movements in an anterior-posterior direction is encouraged to recreate and improve neuromuscular coordination; the same movements are necessary in the lateral direction and then combined across multiple directions, always with the foot in contact with the wall. Once the patient is capable of tolerating an increased load, the physiotherapist can propose the same procedure with the patient first sitting and then standing with the foot resting on the ground. As this stage is focused on proprioception, unstable balance tools should be used in order to enhance both dorsal and plantar flexion. At approximately 50 days, assuming that pain and edema have been resolved or are in resolution, the patient must be encouraged to increase mobility. Exercises and mobility techniques are continue using an elastic band (Thera-Band®, The Hygenic Corporation, Akron, OH 44310, US) to develop progressive resistance in the various planes of motion (Figs. 5 and 6). The patient should be instructed and encouraged to do these exercises even in the absence of the physiotherapist, the so-called phase of self treatment at home is essential at this point in order to optimize the timing and results. Hupperets, et al., (2009) have found that unsupervised proprioceptive home based training could benefit the general population. Basically, rehabilitation at this stage is still focused on proprioception using unstable balance tools with both unilateral and bilateral weight bearing. The final phase of muscular strengthening is dedicated to all antigravity movements in which the foot is in a challenging biomechanical context. The patient undergoes a series of exercises which are in contrast to the body weight acting together with gravity. 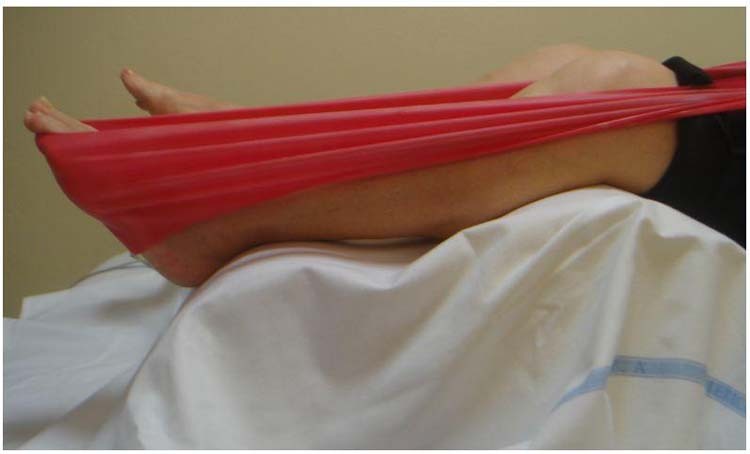 Figure 5 Muscular self-administered strengthening in a supine position (plantar-dorsal flexion) using a Thera-Band®. Figure 6 In a sitting position, the patient is encouraged to carry out movements in all directions regulating/increasing the elastic resistance with their own hands. The starting point of these exercises begins with the full load step on the limb which was operated on; key element for ensuring recovery of the physiological gait. More challenging related exercises are represented by walking uphill with a gradual slope (for example treadmill), climbing the stairs one or two steps at a time and then coming down the stairs (to stimulate the eccentric component of the muscle contraction). Both strength and antigravity exercises are recommended to achieve the full recovery and return to the normal activity. In this phase, the patients should be referred to hydrokinesitherapy to maximize results and improve the postoperative outcome. Berger, et al., (2006), comparing the immediate effects of standard physiotherapy and balneotherapy on postural capacity in subjects with lower limb injuries, observed that exercising under water could reinforce proprioceptive input. A good recovery of foot function can be achieved by proposing implementation of walking synergies such as walking backwards on one’s own toes, walking on heels or cross stepping. The help of a mirror can provide valuable visual feedback in order to correct any altered patterns. One must research transition from normal to faster walking and then to running. The ultimate goal of the rehabilitation project is centered on obtaining the best physical condition closest to the daily activity of the healthy population with the aim of returning to full recovery after surgery. The last phase of antigravity training is completed with proper exercises such as jumping in place or on a trampoline. A gradual resumption of the sports activity previously carried out is allowed and a radiographic check-up is required to verify the implant positioning. Despite the fact that SA was initially proposed for pediatric patients, it is being an increasingly used procedure in the adult population. In this paper we have proposed a classification of the rehabilitative pathway after SA based on our experience also considering the related literature. The main limit of our classification is represented by the absence of a sample with which to make statistical comparisons. Nevertheless, we wanted to address the matter when we realized the need for clarifying and classifying a patient’s physical condition after corrective surgery. Again, even with its limits, this overview should help and stimulate further research. After subtalar arthroereisis with endorthesis, postoperative rehabilitation must be oriented both to protect the surgical site and to enhance mobility of the foot. In order to maximize results and contain clinical risk, the physiotherapist must be able to carry out a functional evaluation and, if necessary, refer patients when complications occur. To this end, a certain degree of multiprofessional cooperation is always recommended in order to ensure patient safety and achieve the best results. 3. Churchill’s Medical Dictionary. New York: Churchill Livingstone, 1989, p. 163. 21. Maxwell JR, Cerniglia MW. Subtalar joint arthroereisis. In: Bank AS, Downey MS, Martin DE, Miller SJ. McGlamry’s Comprehensive Textbook of Foot and Ankle Surgery. 3rd ed. Philadelphia: Lippincott Williams & Wilkins, 2001, vol. 1, pp. 901-914. 23. Gould JS. Direct repair of the posterior tibial tendon. 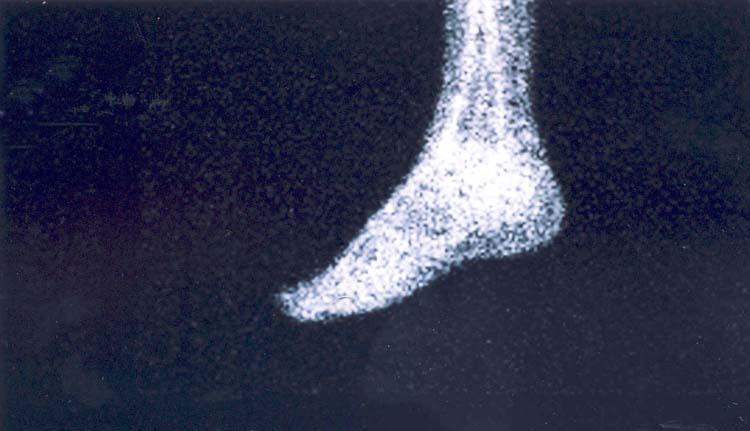 Foot Ankle Clin 1997 2: 275-279. 24. Giannini S, Vannini F, Bevoni R, Romagnoli M, Di Gennaro V. Trattamento chirurgico delle lesioni del tibiale posteriore. In: Progressi in medicina e chirurgia del piede. Bologna: Timeo, 2007 16: 73-87. 1 Physical Medicine and Rehabilitation, Bologna University Hospital, Sant’ Orsola-Malpighi Polyclinic, Bologna, Italy. 2 Orthopedics and Traumatology, Bologna University Hospital, Sant’ Orsola-Malpighi Polyclinic, Bologna, Italy. Subtalar dislocation is the simultaneous dislocation of the distal articulations of the talus at both the talocalcaneal and talonavicular joints. It can occur in any direction and always produce significant deformity. Most common is the medial dislocation. Less common presentations are lateral, anterior and posterior dislocations. These dislocations are associated with osteochondral fractures. Closed reduction and immobilization remains the mainstay of treatment. 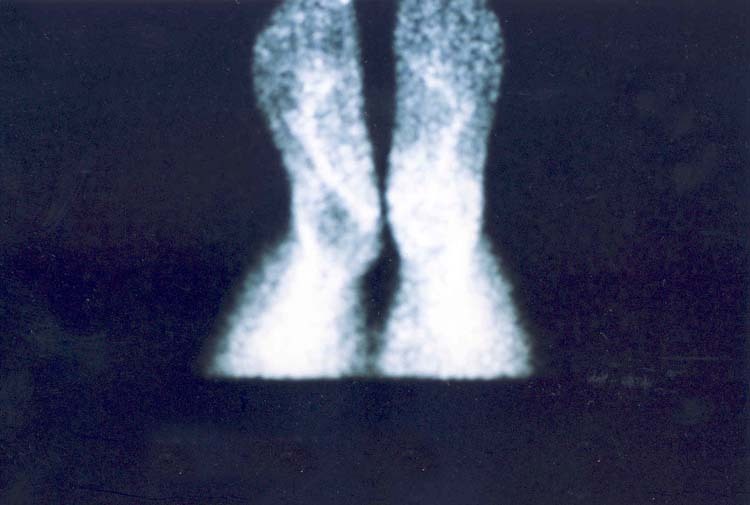 Radiographs and computed tomography scan confirms the post reduction alignment stability of subtalar joints and intra-articular fracture fragments. We report a case of lateral subtalar dislocation without osteochondral fracture fragments in a 30-year-old man. Subtalar dislocations are rarely found in routine orthopedic practice. Many of these dislocations result from high-energy injuries such as falls from a height, athletic injuries or a motor vehicle accident. Inversion or eversion force is dissipated through the weak talonavicular and talocalcaneal ligaments, which eventually result in subtalar dislocation. There are two types of subtalar dislocation. In lateral subtalar dislocation, the head of talus is found medially and the rest of the foot is dislocated laterally. In medial subtalar dislocation, the head of the talus is found laterally and the rest of the foot is dislocated medially. Medial dislocation has been referred to as an “acquired clubfoot”, while the lateral injury is described as an “acquired flatfoot”. We present a case of an adult with lateral subtalar dislocation following a fall. A 30-year-old man who sustained a fall from the stairs came to our emergency department with pain and swelling of the right foot. The foot was diffusely swollen with minimal laceration and tenting of the skin over the prominent talar head which was felt medially. The rest of the foot was found dislocated laterally. (Figs. 1 and 2) Pulse of the posterior tibial and dorsalis pedis artery were not felt due to massive soft tissue distortion. 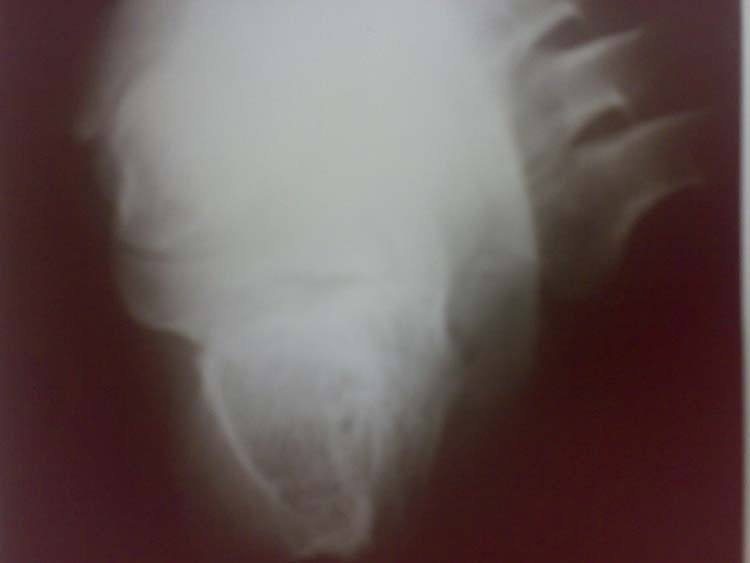 Radiograph of the right foot showed lateral subtalar dislocation. (Figs. 3 and 4) Doppler ultrasound showed normal arterial flow in both posterior tibial and dorsal pedis arteries. Figure 1 The foot was diffusely swollen with minimal laceration and tenting of the skin over the prominent talar head which was felt medially. Figure 2 The right foot was found to be dislocated laterally. 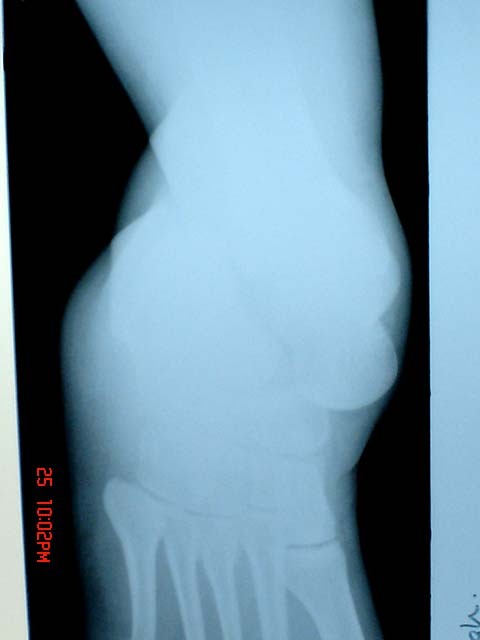 Figure 3 The dorsoplantar view shows the dislocation of the talo-navicular and subtalar joints. Head of the talus was seen lying medially. Normal alignment of calcaneo-cuboid joint is appreciated. Figure 4 The lateral view again shows the dislocation of the talo-navicular and subtalar joints. Head of the talus is severely declinated. Closed reduction was done under spinal anesthesia. Firm manual foot traction with counter-traction on the leg combined with direct digital pressure over the head of talus aided in smooth reduction, which was associated with an audible clunk. 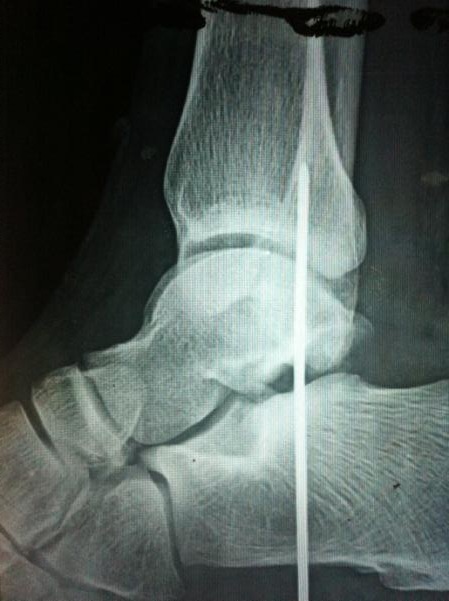 Figure 5 The post reduction anterior posterior radiograph showed normal and stable alignment of subtalar and talo-navicular joints without osteochondral fractures. Figure 6 The post reduction lateral radiograph showed normal and stable alignment of subtalar and talo-navicular joints without osteochondral fractures. Computer tomography (CT) scan confirmed the absence of osteochondral fractures and the stability of the subtalar joints. The patient was immobilized in a short-leg posterior plaster splint for 4 weeks. Following immobilization, the patient underwent a vigorous, active exercise program. The patient progressed to weight bearing and active range of motion exercises to regain subtalar and midtarsal joint motion. Two years after the injury, the patient had a stable, relatively good functional foot with minimal pain on walking on uneven ground. Subtalar dislocation by definition has a normal tibiotalar joint. Most dislocations occur in males (6:1) of early age. Subtalar dislocation can occur in any direction and always produce significant deformity. Most commonly (80% to 85%), the foot is displaced medially with the calcaneus lying medially, the head of the talus prominent dorsolaterally, and the navicular medial and sometimes dorsal to the talar head and neck. [1,2,3] Less commonly (15% to 20%), lateral dislocation occurs. 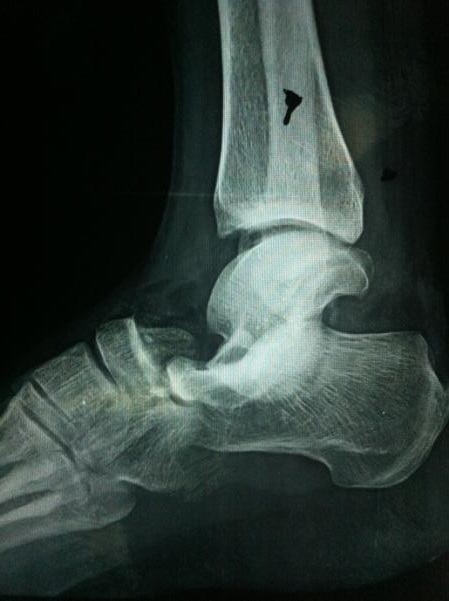 Rare cases of anterior  and posterior  displacement of the foot after subtalar dislocation have also been reported. It is important to distinguish the medial or lateral subtalar dislocations because the method of reduction is different and the long-term prognosis appears to be worse with the lateral dislocation. Between 10% and 40% of subtalar dislocations are open.6 Open injuries tend to occur more commonly with the lateral subtalar dislocation pattern and probably as the result of a more violent injury. Long term follow-up demonstrated very poor results with the open subtalar dislocations. The keystone of treatment for all subtalar dislocations is prompt and gentle reduction under general or spinal anesthesia. All open injuries must be thoroughly debrided at the time of reduction, and the wound should be left open, with delayed primary closure anticipated in 3 to 5 days. Due to the high incidence of associated articular fracture and associate poor prognosis, CT scan of the foot and ankle should be obtained after reduction and splinting. Our patient, who had sustained a fall from stairs, came with a diffusely swollen foot with the head of talus felt medially and the rest of the foot dislocated laterally as a unit. Radiographs confirmed the lateral subtalar dislocation. There was no associated osteochondral fracture. Simple closed reduction was successful. Our literature review showed few reports of isolated lateral subtalar dislocation. We emphasize the importance of proper diagnosis and timely management of dislocations around the subtalar joint, as these tend to result in a significant deformity with joint stiffness. Lateral subtalar dislocation is one such type dislocation which is not mentioned in the literature and should be carefully treated. There should always be a high index of suspicion concerning associated osteochondral fractures. CT scan should be performed after reduction to assess for the intra-articular fractures of the subtalar joint. Open reduction is recommended for irreducible dislocations and fixation is recommended in large displaced, articular fractures that can produce subtalar joint incongruity. 1. DeLee JC, Curtis R. Subtalar dislocation of the foot. J Bone Joint Surg 64A: 433 – 437, 1982. 2. Grantham SA. Medial Subtalar dislocation: five cases with a common etiology. J Trauma 4 (11): 845 – 849, 1964. 3. Heppenstall RB, Farahvar H, Balderston R, Lotke P. Evaluation and management of subtalar dislocations. J Trauma 20 (6): 494 – 497, 1980. 4. Monson ST, Ryan JR. Subtalar dislocation. J Bone Joint Surg 63A (7): 1156 – 1158, 1981. 5. Inokuchi S, Hashimoto T, Usami N. Anterior subtalar dislocation: case report. J Orthop Trauma 11(3): 235 – 237, 1997. 6. Goldner JL, Poletti SC, Gates HS 3rd, Richardson WJ. Severe open subtalar dislocations: long-term results. J Bone Joint Surg 77A (7):1075 – 1079, 1995. 7. Bohay DR, Manoli A 2nd. Subtalar dislocations. Foot Ankle Int 16(12): 803 – 808, 1995. 8. Leitner B. Obstacles to reduction in subtalar dislocations. J Bone Joint Surg 36A (2): 299 – 306, 1954. 9. Naranja RA Jr, Monaghan BA, Okereke E, Williams GR Jr. Open medial subtalar dislocation associated with posterior process fracture of the talus. J Orthop Trauma 10(2): 142 – 144, 1996. 10. Lancaster S, Horowitz M, Alonso J. Subtalar dislocations: a prognosticating classification. Orthopedics 8 (10): 1234-1240, 1985. 4 Professor , Orthopedics, Tamilu, India. Bony ankylosis is a rare consequence of gouty arthritis. 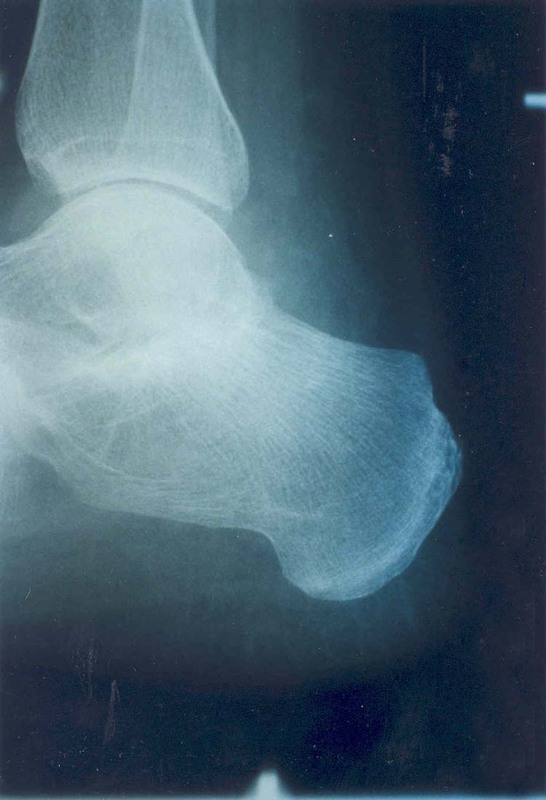 Ankylosis is typically a complication of long standing arthritis. Literature reports have shown that anti-hyperuricemic agents can reverse the urate deposition in a joint, but has no effect on the progression of eventual anklyosis of a joint. In this case, gouty ankylosis of the subtalar joint is reported after a relatively short episode of gout despite the use of anti-hyperuricemic agents and NSAID therapy. Bony ankylosis in gout is extremely rare. The few cases that have been reported in literature typically occur in patients with chronic, sub-optimally treated or severe gout. 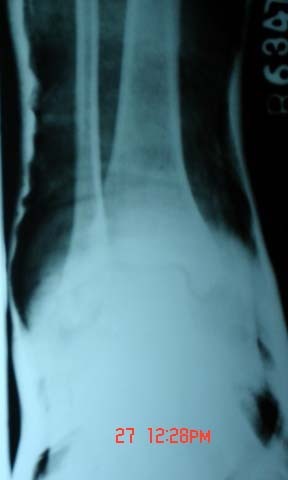 We report a case of bony ankylosis in a patient with gouty arthritis of short duration. 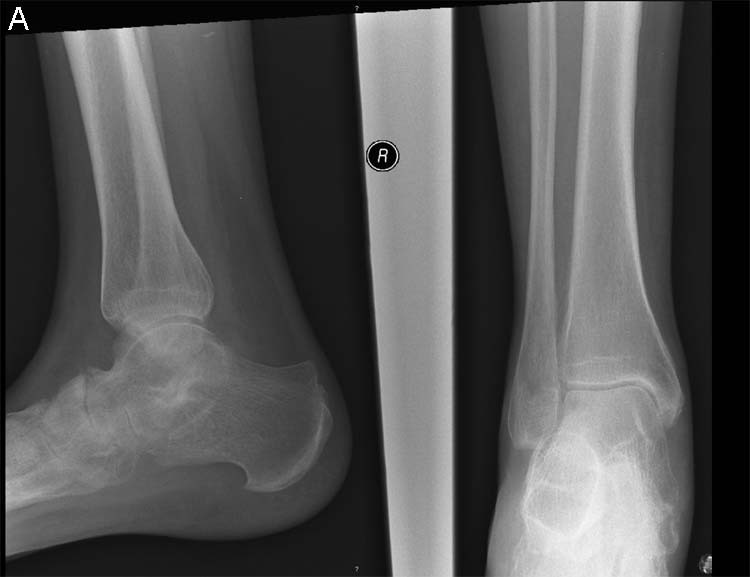 A 43-year-old female presented with pain and swelling of the left ankle of four-month duration. There was no previous history of trauma, infection, or any other joint problem. Physical examination revealed fullness over the medial aspect of the ankle with mild tenderness. There was some restriction of movements of the ankle and subtalar joints. Laboratory tests revealed a normal ESR and CRP with Rheumatoid factor, Anti-nuclear antibody and HLA B27 antigen being negative. Serum uric acid was elevated. Skin and nails did not show any psoriatic features. 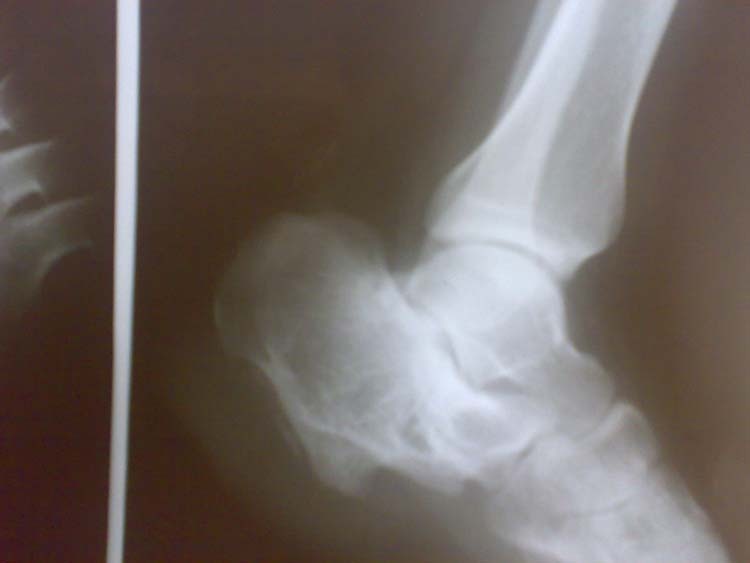 Radiographs of the ankle showed minor degenerative changes with slight narrowing of the subtalar joint space. Patient was started on colchicine as an initial management, and subsequently commenced on allopurinol and NSAID’s. In spite of these measures pain and swelling of the ankle worsened. A bone scan showed increased activity within the subtalar joint. Debilitating nature of symptoms, even with optimal medical treatment, warranted fusion of the subtalar joint. Synovial biopsy revealed a patchy chronic inflammatory cell infiltrate, but monosodium urate crystals were not detected. At one-year follow up, the joint remained solidly fused both clinically and radiologically, and the symptoms had resolved completely. However, the patient complained of pain in the opposite ankle. Examination revealed pain with restriction of movement of the right subtalar joint. Patient was advised to continue with allopurinol and NSAID. A highly unusual feature in our case was the fact that the patient developed ankylosis within a short duration of the first acute attack on that side. The patient had no evidence of rheumatic disease known to cause ankylosis, such as ankylosing spondylitis, psoriatic arthritis, or diffuse idiopathic skeletal hyperostosis. Although biopsy did not reveal gouty crystals, Pascual, et al.,  have shown total disappearance of crystals from joints in patients who were treated with urate lowering drugs, and have also determined the time needed for this to happen. 1. Hughes GR, Barnes CG, Mason RM. Bony ankylosis in gout. Ann Rheum Dis. 27 (1): 67-70, 1968. 2. Ludwig AO, Bennet GA, Bauer W. A rare manifestation of gout: widespread ankylosis stimulating rheumatoid arthritis. Ann Intern Med. 11: 1248-1276, 1938. 3. Good AE, Rapp R. Bony ankylosis. A rare manifestation of gout. J Rheumatol. 5(3): 335- 337, 1978. 4. Pascual E, Sivera E. Time required for disappearance of urate crystals from synovial fluid after successful hypouricaemic treatment relates to the duration of gout. Ann Rheum Dis. 66: 1056-1058, 2007. 5. Cortet B, Duqesnoy B, Amoura I, Bourgeois P, Delcambre B. Gout with ankylosis. Rev Rheum [Engl. Ed.]. 61(1): 44-47, 1994. 6. Shoji A, Yamanaka H, Kamatani N. A retrospective study of the relationship between serum urate level and recurrent attacks of gouty arthritis: evidence for reduction of recurrent gouty arthritis with antihyperuricemic therapy. Arthritis Rheum. 51 (3): 321-325, 2004. 1,2,3 Department of Orthopaedic Surgery, Monklands Hospital, Airdrie, UK. A 49 year-old patient, with a history of rheumatoid arthritis, presents with suspected septic arthritis of the ankle and subtalar joints. The patient was found to have osteomyelitis of both the talus and calcaneus. The patient was treated by debridement, antibiotic impregnated PMMA beads, and ultimately, a subtalar joint fusion. This case illustrates the importance of the early recognition and diagnosis, the possible sequelae, and the need for aggressive treatment of a septic joint. Osteomyelitis is traditionally subdivided into three categories based on etiology. The first type is hematogenous osteomyelitis. This form is commonly monomicrobial, with staphylococcal organisms isolated most frequently. The second type is direct extension osteomyelitis. It is usually polymicrobial in origin and seen more frequently in the general population. Sources of direct extension osteomyelitis include puncture wounds, surgery, implants, contiguous ulcerations, and septic arthritis. Septic arthritis is the most destructive form of arthritis. It is classified by its offending pathogen or etiology. Neisseria gonorrhea is commonly isolated from sexually active adults with associated superficial lesions. Haemophilus influenza is commonly isolated from children under the age of two. Staphylococcus and Streptococcus species, which are the most common offending pathogens overall, are seen in children over the age of two and in adults. The etiologies are very similar to osteomyelitis. A joint is susceptible to infection because of the profound vascular supply within the synovial joint lining. The joint may be even more prone to an infective process given an existing arthritide, such as rheumatoid arthritis. Arthritis not only causes direct damage to the joint, but may also be treated with repeated corticosteroid injections that can decrease the joint’s immunocompetence. A 49 year-old white female with a past medical history of long term rheumatoid arthritis and a sedentary lifestyle, presented to the clinic complaining of a painful left ankle. The ankle became painful, erythematous, and edematous three months prior, and was accompanied by fever and chills. The patient did not initially seek treatment. Ten to fourteen days later, with rest and a decrease in activity, the erythema and edema subsided without the use of antibiotics, however, the pain persisted. The patient then went to see her rheumatologist, who treated her with physical therapy, an NSAID, and a steroid injection of the left ankle. The patient denied trauma, but did note a superficial cat scratch to the anterior aspect of her left lower leg one to two weeks prior to the onset of pain, which she treated with a topical antibiotic. On initial physical examination significant findings revealed a globally edematous left ankle. The swelling was markedly more edematous on the lateral aspect of the ankle. There was pain on palpation of the anterior, lateral, and posterior aspect of the ankle joint. Pain was elicited with eversion and dorsiflexion of the ankle and there was no pain of the subtalar joint with range of motion. The neurovascular status of both extremities was intact. Plain films of the left foot and ankle, taken on a previous presentation did not reveal a fracture or dislocation, although there was significant degenerative joint disease of the left ankle joint. Figure 1 CT scan revealed joint narrowing consistent with degenerative arthritis. A large area of bone lysis is seen in the body of the os calcis. Plain films, taken shortly after that time, corresponded with the CT findings. We concluded that degenerative changes of the talus, calcaneus, and subtalar joint were probably the result of an infective process. Figure 2 Following surgical debridement of osteomyelitic bone, antibiotic impregnated PMMA beads were inserted. Cultures revealed staphylococcus aureus osteomyelitis. 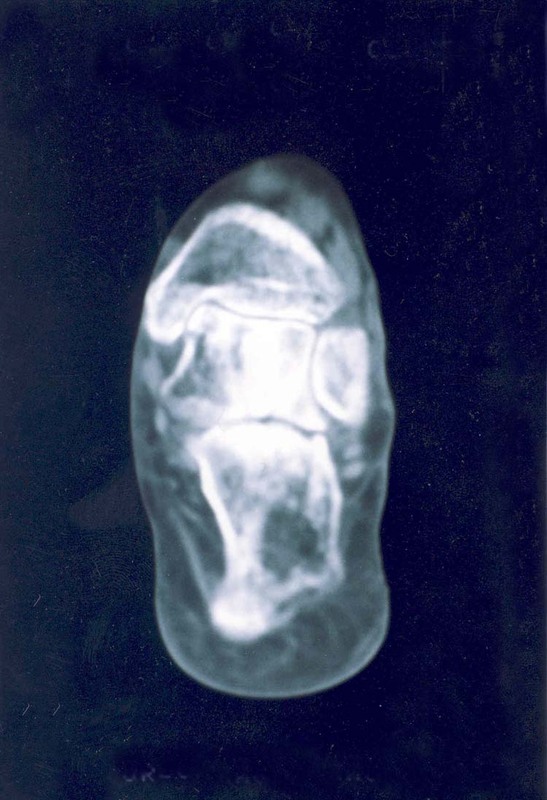 Figure 3 Ceretec white blood cell bone scans performed six weeks after insertion of PMMA beads were negative for any signs of active osteomyelitis. Figure 4 Iliac bone graft is used with a single cannulated cancellous screw to fuse the subtalar joint. Intravenous antibiotics were discontinued and the patient was put on a two-week course of oral cephalexin. The postoperative course involved a non-weightbearing, below-the-knee cast for eight weeks with progression to a non-weightbearing removable cast walker (RCW) for three weeks. The patient was then placed in a weightbearing RCW for another three weeks. Proper foot orthoses and ankle brace was fitted when the patient progressed to her shoes. 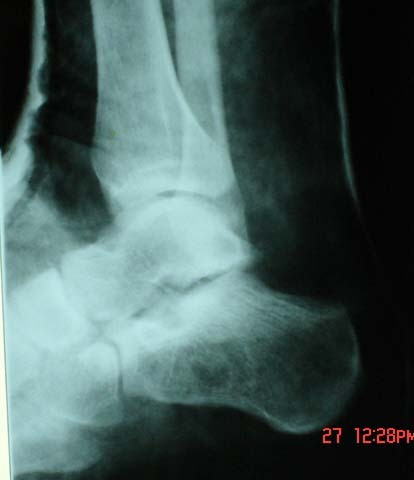 Figure 5 Six months after fusion, the subtalar joint is stable and without pain on ankle and foot range of motion. The patient is now ten years post surgery. She is enjoying a healthy lifestyle that includes jogging without pain. There are many questions that arise from this case report and should be addressed to make any pertinent conclusions. Assuming bacteremia one must decide on the location of the infection. 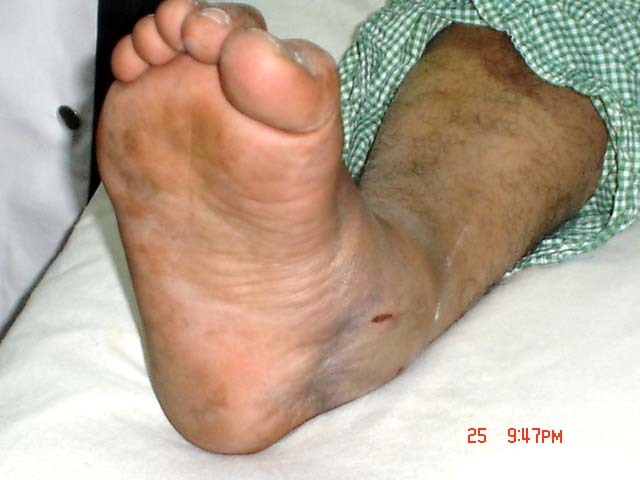 Given the patient’s report, it is easy to assume ankle joint sepsis. The suspicion is heightened by the possible propagating of infection by a local joint injection to the ankle joint. The clinical and radiographic findings also suggest extra-tibiotalar sepsis. 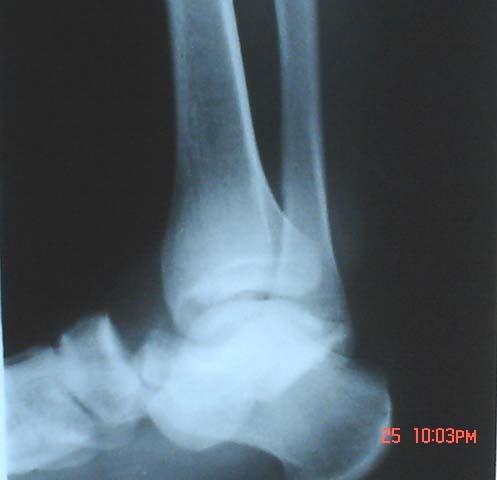 An effusion of the subtalar joint may present with ankle joint swelling that is more prominent below the lateral malleolus, given the communicating lateral anatomy of the subtalar and ankle joints. 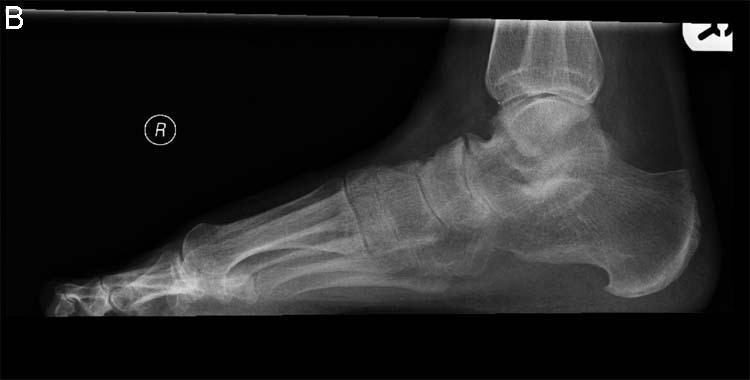 Computerized tomography of the foot and ankle further supports the hypothesis of subtalar sepsis by displaying adjacent boney lesions located in the inferior talus and superior calcaneus. Therefore, the original septic joint may have been the subtalar joint in isolation or in combination with the ankle joint. It appears the detrimental sequelae of osteomyelitis developed only in the subtalar joint. This patient most likely developed subtalar septic arthritis from an uncommon hematogenous route. The infection was not drained and may have been even propagated with a corticosteroid injection and spread contiguously to the talus and calcaneus. Once recognized, the osteomyelitis was aggressively treated with surgery and appropriate intravenous antibiotic therapy. The case illustrates three important points about the septic joint. First, the suspicion of a septic joint must be diagnosed and treated appropriately and aggressively by joint aspiration, if possible, and proper cultures and definitive antibiotics. Secondly, early intervention in these cases is paramount, as demonstrated graphically by this case. Finally, if complications, such as osteomyelitis, do occur, proper aggressive surgical treatment must be performed promptly. 2. New York, Churchill Livingstone, 1990, 275-313. 3. Chodakewitz, J., Bia, F. : Septic Arthritis and Osteomyelitis form a Cat Bite. Yale Journal of Biology and Medicine, 61:513-518, 1988. 4. Kothari, T. et al. : Pseudomonas cepacia Septic Arthritis due to Intra-articular Injections of Methylprednisolone. Canadian Medical Association Journal. 116(11): 1230, 1232, 1235, June 1977. 5. Gowans, J., Granieri, P. : Septic Arthritis. Its Relation to Intra-articular Injections of Hydrocortisone Acetate. New England Journal of Medicine 261: 502-503, 1959. 6. Freeland, A., Senter, B. : Septic Arthritis and Osteomyelitis. Hand Clinics 5: 533-552, November 1989. 7. Cunningham, R., Cockayne, A., Humphreys, H. : Clinical and Molecular Aspects of the Pathogenesis of Staphylococcus aureus and Bone and Joint Infections. Journal of Medical Microbiology 44(3): 157-164, March 1996. 8. Sternbach, G., Baker, F. : The Emergency joint: Arthrocentesis and Synovial Fluid Analysis. JACEP 5: 787-792, October 1976. 9. Calhoun, J., Mader, J. : Antibiotic Beads in the Management of Surgical Infections. American Journal of Surgery 157: 443-449, April 1989. 10. Russotti, G. et al. 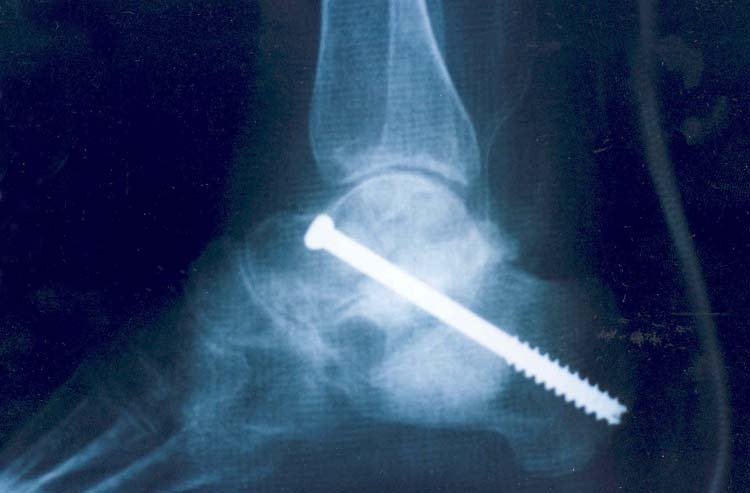 : Isolated Talocalcaneal Arthrodesis. Journal of Bone and Joint Surgery 79-A: 1472-1478, December 1988. 11. 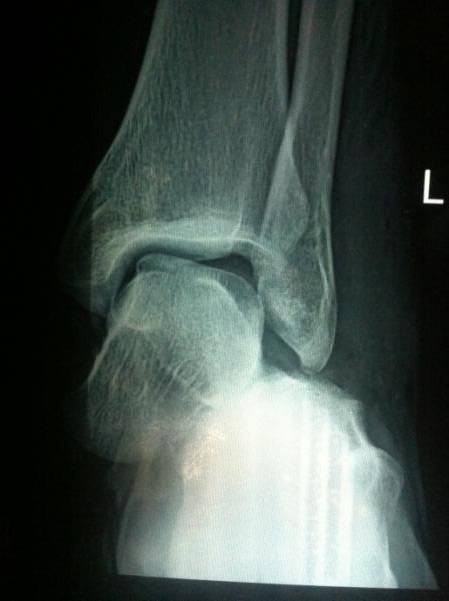 Thomas, F. : Arthrodesis of the Subtalar Joint. Journal of Bone and Joint Surgery 49-B: 93-97, February 1967. 12. Perry, A. et al : Antimicrobial Realease Kinetics From Polymethylmethacrylate in a Novel Continous Flow Chamber. Clinical Orthopaedics and Related Research 403, pp. 49-53 2002. 13. Walenkamp, G. et al : Osteomyelitis Treated With Gentamicin-PMMA Beads. Acta Orthop Scand 69 (5): 518-522, 1998. 1Director of Residency Training, Associate Professor, University of North Texas Health Science Center, John Peter Smith Hospital, Department of Orthopaedics, 1500 South Main Street, Ft.Worth, Texas 76104. 3Staff Physician, Assistant Professor, University of North Texas Health Science Center, Department of Orthopaedics. 1500 South Main Street, Ft. Worth, Texas 76104.